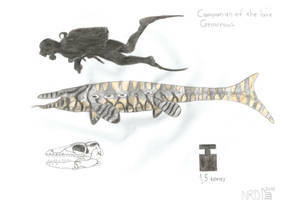 A quick drawing of one of the weirder Maastrichtian mosasaurs. Pluridens is one of those overlooked and obscure prehistoric creatures that turn out to be quite fascinating when you learn more about them. It was a halisaurine mosasaur (which in on themselves are a weird bunch, look them up) that first appeared during the Late Campanian and represents what you would refer to as a "third-wave" mosasaur genus (megabass22.deviantart.com/jour…). What sets Pluridens apart from other halisaurines and other mosasaurs in general is that it has a long and narrow dentary (likely the same for the upper jaw, but only the dentary is known) with a huge number of teeth, almost twice the amount of most other mosasaur genera. It is thus speculated to have been a rather specialized genus, probably chasing after thin-shelled invertebrates and fish that it could swallow whole. The original authors speculate that it occupied a similar ecological role to some of the earliest ichthyosaurs of the Triassic period due to similarities in the elongation of the jaws and the tooth battery. This image is licensed under Creative Commons Attribution-Noncommercial-Share Alike 3.0 meaning that you are free to share and edit the image as long as you give appropriate credit, note what changes were made and share it under the same license as the original. It is not allowed to be used for commercial (e.g. making money) purposes. Cool, didn't know about Halisaurines. Well, I read the name in your cladogram when you posted it, but you get what I mean. To be fair, looks into mosasaur subfamilies and what separates them is a pretty specific thing and rarely come up in things other than phylogenetic studies. There are several mosasaur subfamilies, but the halisaurines has struck me as the weirdest with them being relatively poor swimmers and evolving in a variety of different directions. You're so good at coloring! Nice drawing of an interesting reptile.